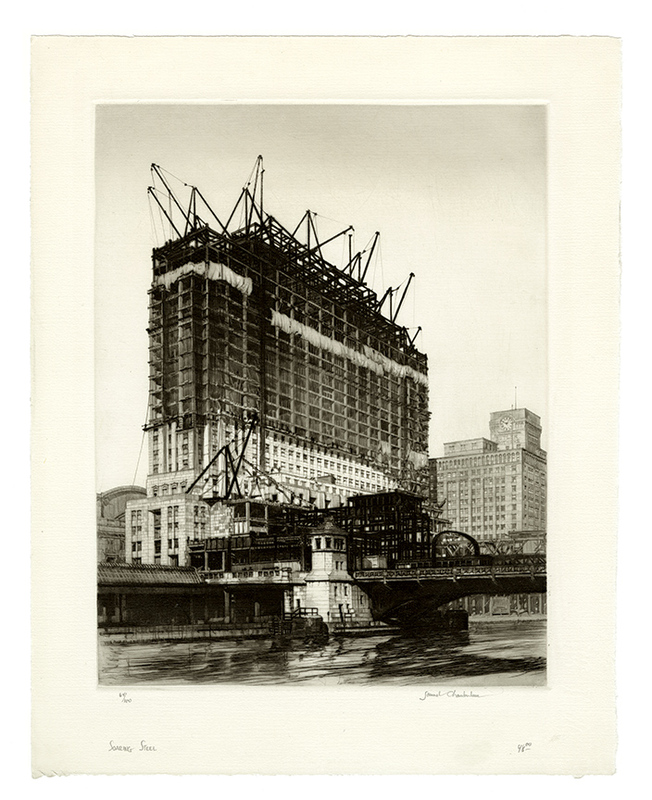 Soaring Steel -- 1929, Drypoint. Chamberlain and Kingsland 79. Edition 100. Signed, titled and numbered 64/100 in pencil. Annotated 48.00 in pencil, in the artist's hand, bottom right margin. A superb, richly-inked and finely-detailed impression, with seletively wiped platetone, on heavy Rives cream wove paper; full margins (1 3/8 to 1 7/8 inches), in excellent condition. 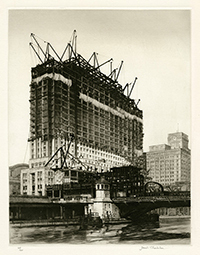 The subject of the print is the construction of the Daily News Building in Chicago, Illinois. Collections: Art Institute of Chicago, Boston Public Library, Crystal Bridges Museum of American Art, Museum of Modern Art, New York Public Library, University of Michigan Museum of Art, Smithsonian American Art Museum, Western Australia Museum. 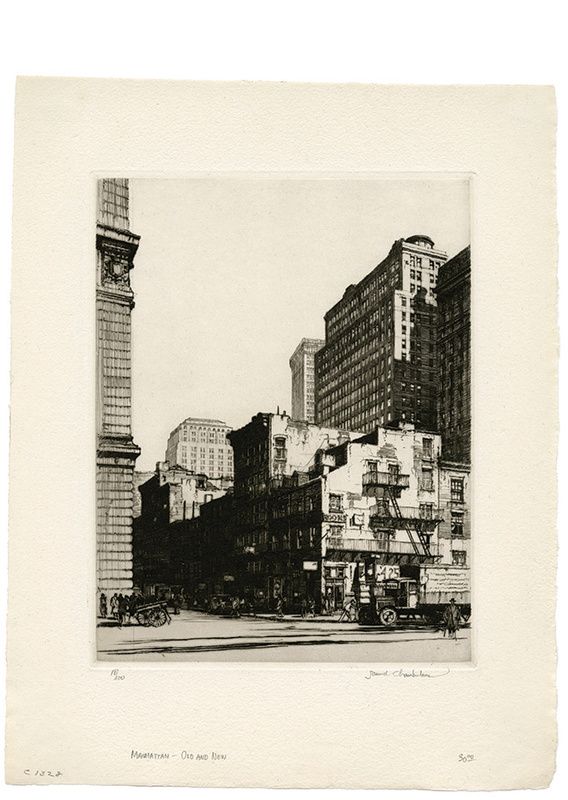 Manhattan Old and New -- 1929, Drypoint. Chamberlain and Kingsland 81. Edition 100. Signed, titled and numbered 81/100 in pencil. Titled and annotated 30.00 in pencil, in the artist's hand, bottom margin. Image size 8 3/4 x 6 13/16 inches (222 x 173 mm); sheet size 12 3/4 x 10 inches (324 x 254 mm). A superb, richly-inked and finely-detailed impression, with seletively wiped platetone, on heavy Rives cream wove paper; full margins (1 1/2 to 2 1/4 inches), in excellent condition. 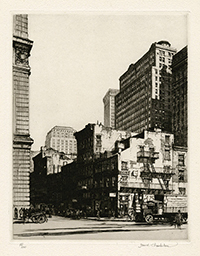 The subject of the print is the lower Manhattan cityscape just prior to the Depression.